A new Emory cancer genomics center that targets networks of interactions between proteins is expected to make significant contributions to drug discovery for the treatment of cancer patients. The Emory Molecular Interaction Center for Functional Genomics (MicFG) is funded by a five-year, $4.2 million grant from the National Cancer Institute (NCI). It will focus on protein-protein interactions (PPI), a new dimension of cancer genome and drug discovery that is considered challenging but highly promising. MicFG will be a key participant in the Cancer Target Discovery and Development (CTD2) network of the NCI. Emory is the only southeastern center in the nine-member network. Recent large-scale cancer genome initiatives have generated large amounts of data about genomic alterations in a number of cancer types, but sorting through this data and translating the knowledge into effective therapies remains a daunting challenge. The new center aims to bridge this gap by focusing on PPI networks. "Genomic alterations in tumors often lead to re-wired PPI networks that drive tumor development and progression," says Haian Fu, PhD, professor of pharmacology, hematology & medical oncology in Emory School of Medicine and principal investigator and leader of the MicFG. "Our central hypothesis is that these tumor-associated PPI hubs and pathways play pivotal roles in transmitting oncogenic signals. Our goal is to map these PPI hubs and pathways, identify new molecular targets, and disrupt these hubs through new ‘pathway-perturbing’ drugs.’"
The existing Emory Chemical Biology Discovery Center, led by Fu, houses state-of-the-art high-throughput technology platforms that enable the efficient identification of PPI networks and potential drug targets in addition to small molecule drug discovery. The center has extensive research experience, including earlier NCI-funded projects, in functional genomics research and genomics data mining and analysis. In the MicFG, researchers will use powerful protein biosensor technologies to systematically establish cancer-specific PPI hubs and networks that signal tumor initiation and progression. Through bioinformatics analysis they will mine cancer genomics data and integrate PPI data into maps and models that will be coupled to experimental studies to establish potential drug targets. Fadlo Khuri, MD, deputy director of the Winship Cancer Institute of Emory University, will co-lead the MicFG center and focus on translational cancer biology – directing new drug discoveries into patient therapies. Joel Saltz, MD, PhD, director of the Emory Center for Comprehensive Informatics and a Georgia Research Alliance Eminent Scholar, will co-lead the center and direct its genomics bioinformatics component, including developing algorithms and bioinformatics tools for genomic mining and analysis of high throughput data. 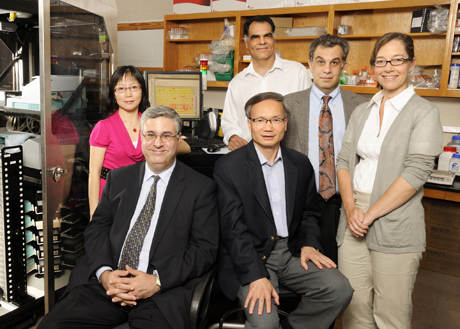 Project leaders of the MicFG in the CTD2 include Yuhong Du, PhD, associate director of the Emory Chemical Biology Discovery Center and assistant professor of pharmacology, and Carlos Moreno, PhD, scientific-director of the Cancer Genomics Shared Resource and associate professor of pathology and laboratory medicine. "Significant genetic alterations associated with cancer have been identified over the past three decades, but only recent genomics initiatives have allowed the systematic discovery of critical changes throughout the entire cancer genome and the generation of tremendous amounts of data for different tumor types," says Khuri. "The development of high-throughput methods for sorting out cancer genomics is a critical next step for linking this data to treatments for patients. Our technologies and expertise will allow Emory researchers to rapidly discover cancer PPI networks for each tumor type and identify novel targets for therapeutic intervention." Researchers expect that targeting PPIs through new drugs will provide a synergistic effect with conventional therapy and reduce drug resistance. The MicFG, as a critical component of the CTD2 network, will provide expertise in high-throughput PPI-based cancer target and drug discovery, a highly collaborative project-team culture, and collaborations with other CTD2 network centers.